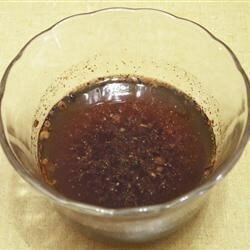 "A dipping sauce for rice rolls and for barbecued chicken, beef, pork or fish. Perfect for salads as is, or mix with a little vegetable oil. Make smaller quantities with lime or lemon juice but refrigerate as this will not last as the rice vinegar version does." In a medium bowl, combine the fish sauce, rice vinegar, water, sugar, garlic powder and chile pepper. Stir until sugar is dissolved. Taste to make sure the sweet, sour, salty and spicy flavors are balanced and adjust if necessary. Pour into bottles and seal with lids. See how to make beautiful Vietnamese spring rolls. Very yummy alongside the homemade Vietnamese Spring Rolls recipe from this site. This was pretty good, and very similar to the dipping sauce at my favorite restaurant. I think it might be better if it were a little sweeter though. I will make this again.